If you’re planning a Similan speedboat tour from Khao Lak or Phuket to go snorkelling, swimming or just to take in the picturesque Islands. 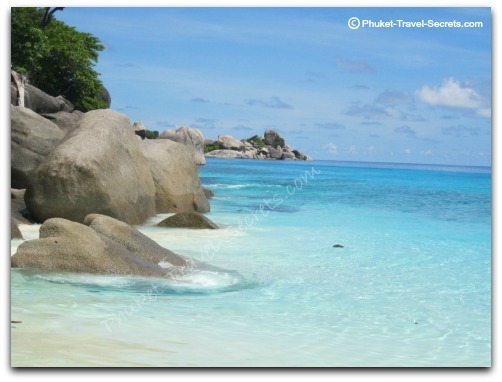 We can highly recommend the professional and friendly service provided by Fantastic Similan Travel. 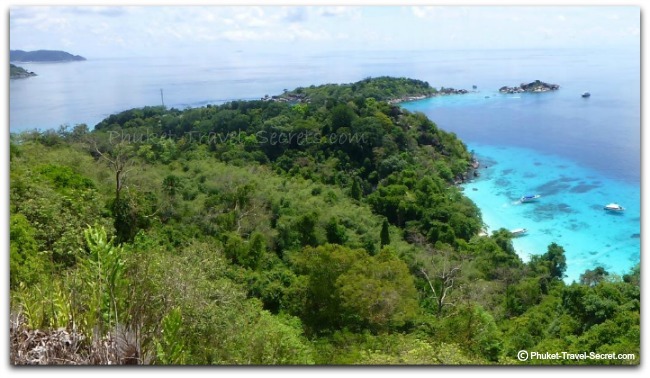 After doing a little research online, Fantastic Similan Travel proved to have the best reviews. 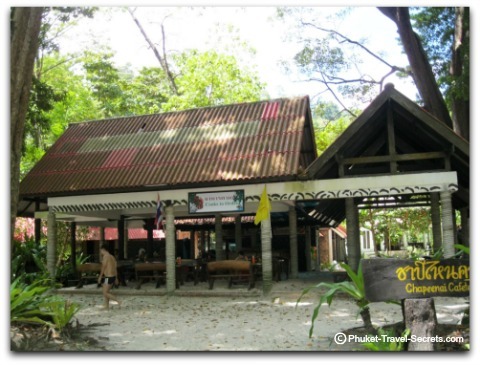 So we booked and payed for our Similan speedboat tour through a local travel agent that was located near our resort in Khao Lak, and to our surprise we were given a very good price as it was mid-April and nearing the end of the season. 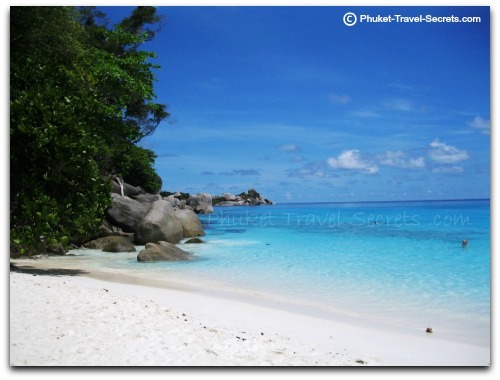 The Similan Islands lie roughly 50 kilometres west of Khao Lak and are a playground for divers and snorkeler’s alike. The Islands are only open from November through to May, and even though there are nine Islands that make up this group of Islands, you can only set foot on two, that being Maing Island (Island #4) and Ko Similan (island #8). You can read more about the Islands here. 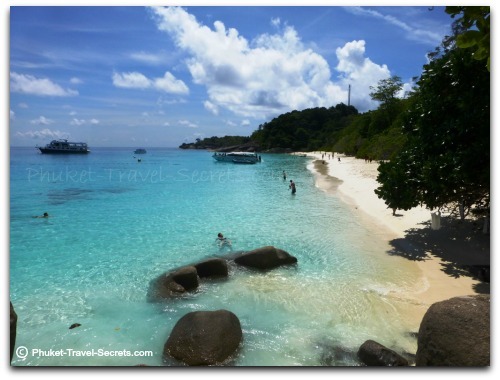 On the morning of our Similan speedboat tour we were picked up from our hotel on time and taken in a jazzy air conditioned mini bus to the pier just to the south of Khao Lak Beach. Once at the pier we were introduced and welcomed by the crew and provided with juice, water, tea and coffee and everyone was offered sea sickness tablets. We tried on or snorkeling gear, to make sure it was a good fit and listened to a safety brief from the crew of Fantastic Similan Travel before boarding the boat. The speedboat was roomy and well equipped with life jackets and everybody on-board was provided with ample refreshments, snacks and fruit throughout the one and a half hour journey to our first stop at Miang Island. We arrived at Miang Island around 10.30, where we were told that we could go swimming and snorkeling or if we were feeling adventurous we could go for a hike up to Lankhaung viewpoint before lunch. The water looked so inviting that we decided to go for a swim and do a little snorkeling, so we made our way to the beach on the other side of the Island. 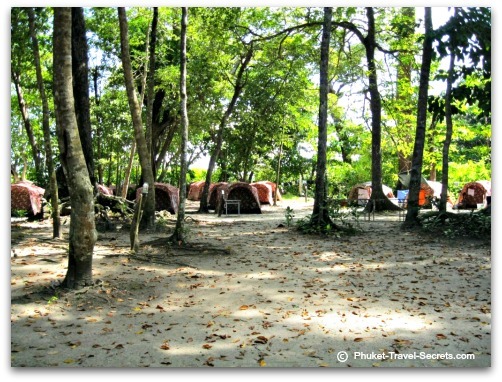 On our short hike through the forest we checked out the camp grounds and bungalows which are run by the Mu Ko Similan National Park for overnight visitors. The beach was spectacular; the water was clear and inviting. There were a couple of other boats moored in the water and a few people on the beach, however it was far from being overcrowded. On our way back to the other side of the Island my adventurous other half decided that we should go for a walk and checkout the viewpoint. I won’t lie the hike up to the viewpoint was tricky especially in our thongs; nevertheless definitely worth doing, thankfully the National Park have placed a series of ropes along the track which came in handy especially along the steep sections. The hike was definitely worth doing; check out the stunning views from the top of Lankhaung Viewpoint. We returned to the beach just in time for a delicious lunch that was set up by the crew, on offer was a selection of tasty stir fries, noodles, rice, Thai curries, fresh fruit and ample cold drink and water. After lunch we were back on-board the speedboat and on our way to the first official snorkelling spot just off the coast of Payu Island (Island #7). We didn’t see a lot of coral here but there was an abundance of colourful fish. When everybody was back on-board and showered with fresh water courtesy of the crew, we made our way to our next snorkelling spot near Ba ngu Island (Island #9). For us this snorkelling spot was the highlight of our Similan speedboat tour as we came face to face with a green sea turtle. The crew said that we may see some turtles but to actually have one swim directly underneath us was simply amazing. We had the area to ourselves for around 30 minutes before other Similan speedboat tours started to arrive. Once back on-board we cruised to our final destination and the largest Island, Ko Similan (Island #8). 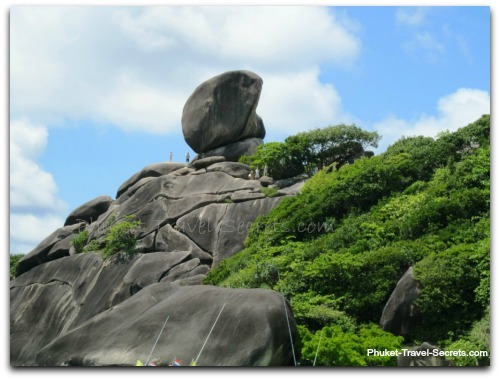 The main feature of Ko Similan apart from the beautiful beach with its crystal clear waters and white sand is the Island's signature landmark "Sail Rock" or as some people call it "Donald Duck Rock". It's easy to recognize and one of the most photographed sights of the Similans. As much as the water looked inviting we decided to make a beeline to the viewpoint as we only had an hour and there were loads of other similan speedboat tours arriving in the bay. The hike to Donald Duck Rock was not as gruelling as the hike that we had on Island #4 but we did have to navigate our way through a few crevices and cross some precarious looking walkways and rickety wooden stairs. Once you reach the top of Sail Rock the views of the beach and the bay are simply amazing. We spent sometime taking in the incredible views and watching the snorkelers enjoying their final snorkel for the day before we made our way back to the beach just in time for one last swim before we had to get back on the boat for our return journey to Khao Lak. No doubt there are many other speedboat companies that do similar day trips from Khao Lak and Phuket but from our own personal experience, you can’t go past Fantastic Similan Travel and their enthusiast and professional crew for a relaxing and fun day out. We enjoyed the crews company so much that we meet up with them after the speedboat tour to watch them perform at Mr Moo Moo Cabaret show in Khao Lak. 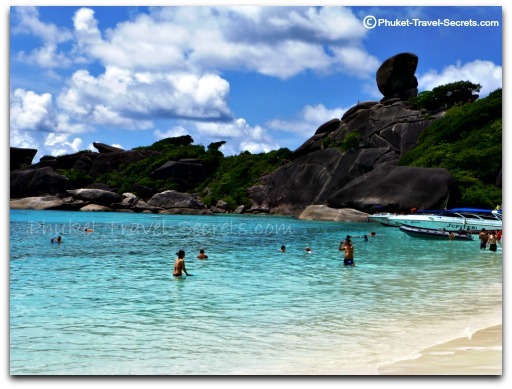 Fantastic Similan Travel operates Similan speedboat tours from both Khao Lak and Phuket. 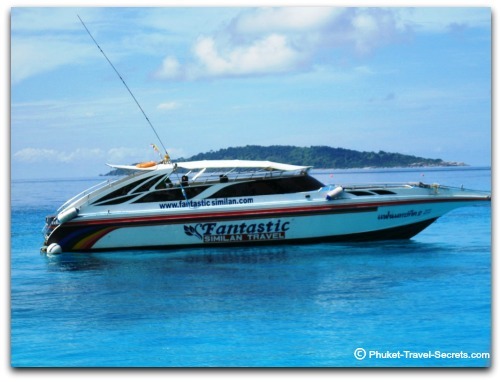 You can book your Similan Speedboat tours with travel agents in Khao Lak or Phuket or alternatively you can contact Fantastic Similan Travel for more information and up to date prices by visiting their website.